The Kanazawa Hyakumangoku Festival (百万石まつり) is Kanazawa’s main annual festival. It is held for 3 days centered around the first Saturday in June each year. The term “Hyakumangoku” literally means a “1 million koku’s of rice”, with a koku being a measurement in Japan. This would equal to around 5 million bushels of rice. The festival commemorates the entry of Lord Maeda Toshiie into Kanazawa Castle, which happened back in 1583. 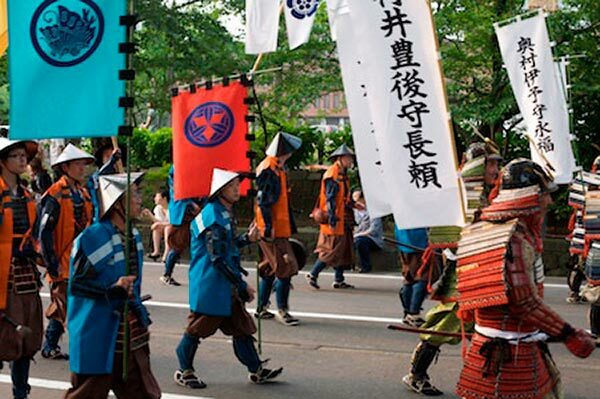 The highlight of the festival is the Hyakumangoku Parade, which reenacts the entrance of Lord Toshiie. An actor plays the role of the feudal lord Toshiie every year, leading the parade on horseback. He is followed by more than 2,000 residents, all of which are dressed in period-appropriate clothes for the 16th-century. The night leading up to the parade, lit Kaga Yuzen lanterns are floated down the river Asano at sundown, starting near the Tenjin-Bashi bridge. Seeing all the lanterns reflecting in the water as they float downstream was absolutely beautiful. It’s a great activity to take part in. 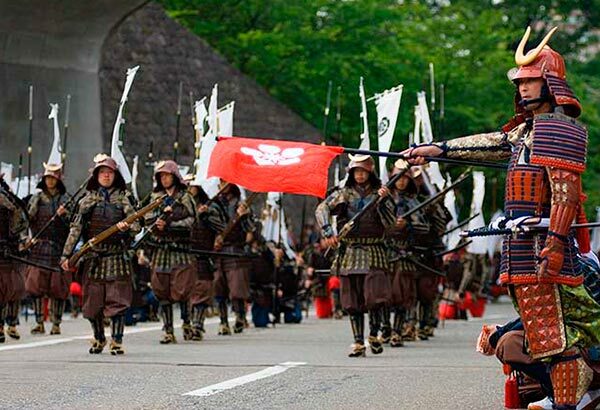 The parade, which begins on the Saturday afternoon, starts at Kanazawa station and ends just over 3 kilometers away at Kanazawa Castle Park. The entire parade route takes about 2 hours, and there is a finale of sorts at the end. In the evening, thousands of people dance take part in Bon Dances in the streets around the city, where anyone can join in the fun. It is then that you will see traditional Takigi Noh dances. Many people are dressed in colorful kimonos sponsored by their employers, but there are also people wearing normal clothing as well. The line of people dancing near central Kohrinbo is very picturesque as it reaches several kilometers long. There are also tea ceremonies taking place all across the city, as well as performances of traditional arts and folk dancing, children’s drumming, and lantern parade. 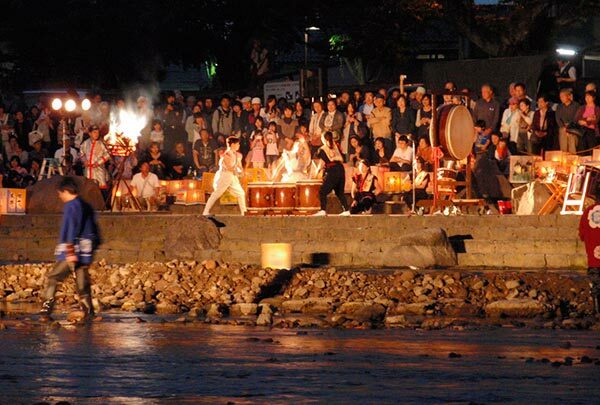 It is a beautiful time to visit Kanazawa as the whole city emits a festival atmosphere!